Hi lovelies! Just a quick one today as I tweeted the other day to ask if you guys would like to see a mini beauty haul of a few things I'd picked up lately and a lot of you said yes, so here we go! I was wandering round my local town with Darren on Sunday, initially looking for a coat, jumpers, scarves, generally Autumn appropriate things. However I managed to come home with none of those things and as I was disappointed at not finding a pretty coat or tartan scarf (not a single one to be seen, what is my town? ), I decided to pop to Superdrug and Topshop to pick up some makeup goodies instead, because everyone knows that pretty lipstick and glitter nail polish (among other things) is the answer to all life's little let downs. So, lately I've been off the gel nails and back on regular nail polish, so I've been going a bit nail polish mad these days. On this particular trip, I picked up one of the new Barry M Matte Polishes in Vanilla, a stunning light taupe/ grey colour, this reminds me a lot of the infamous Porchester Square by Nails Inc, but of course with a matte effect! 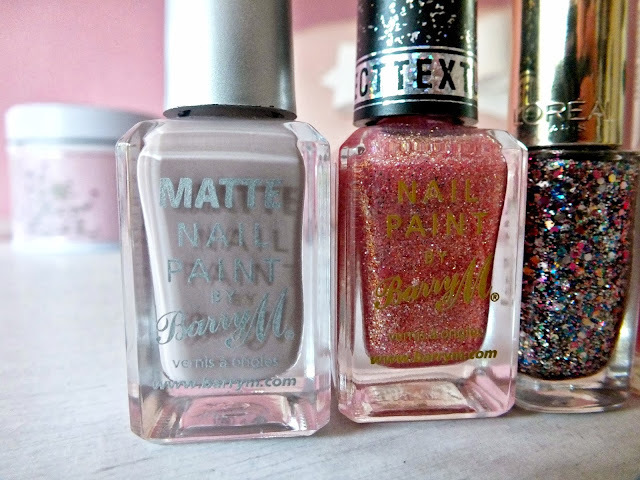 I then picked up another of Barry M's latest additions, a Textured Effect polish in 'Princess', a stunning coral toned pink with gold and silver glitter. Then, as it is practically Christmas (right? ), I figured I was definitely allowed to pick up another glitter polish and went for L'Oreal's Sequin Explosion. This is a beautiful multi-coloured glitter, it's more of a glitter topcoat, but it can definitely be built up for a full on sparkly effect! Finally, I picked up a Topshop polish, as I find it very hard to leave a Topshop makeup counter without one, I think the quality is fantastic and at only £5-6 a go, you can't go wrong! This time, I went for Keepin' It Sweet, a pretty light coral pink shade. This looks absolutely stunning with Barry M Princess on the ring finger, which the eagle eyed among us may have spied on my Instagram lately! While in Superdrug, I spotted the MUA Matte Perfect Primer, which I heard is supposed to be the drugstore equivalent of Benefit's PoreFessional, which is my favourite primer of all time, so I'm giving this a go and I'll review it asap! I then picked up a couple of makeup bits in Topshop as they had a few bits and pieces I hadn't seen before so I decided to give them a go! I adore Topshop Cream blushes and had run out of my favourite 'Flush', but I decided before buying it again, I'd try a new one. I hadn't seen Morning Dew before so I'm not sure if it's old or new! But for those who haven't seen it, it's a pretty bright, warm toned pink that can be built up for a really bright colour or blended for a very subtle flush, so pretty! 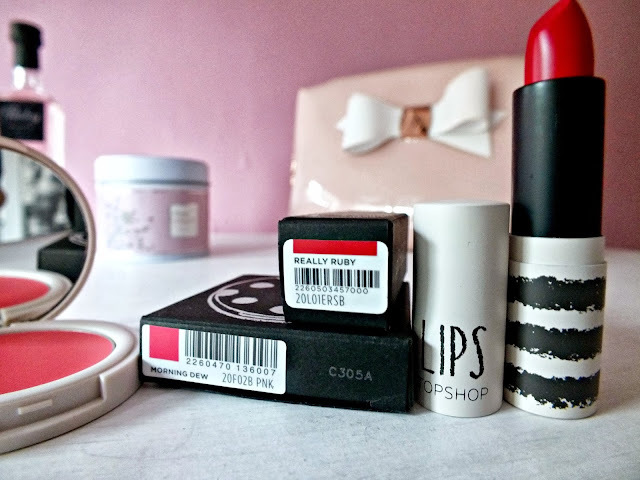 Then, as it's that time of year again, I decided I needed a new red lippie in my collection, so I chose Really Ruby, which is another I'd never seen in Topshop before. This is a stunning glossy, blue toned red. I'll do swatches and things in another post soon! 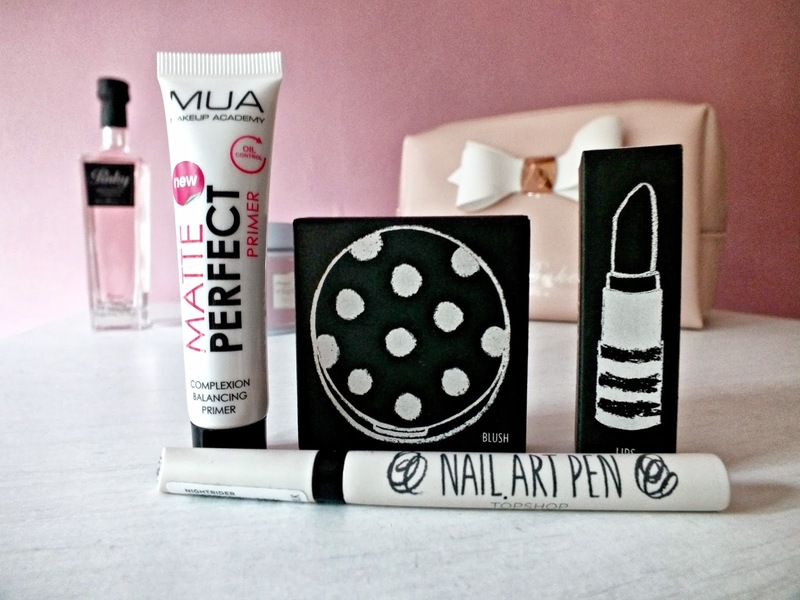 Finally, while in Topshop, I noticed a few bits and bobs on sale near the til and found this black Nail Art pen for just £1! How could you not? I'm thinking of possibly doing some nail art tutorials with this, possibly Halloween themed? Let me know if you'd like to see that! What do you think? Let me know if you'd like to see anything reviewed or swatched and I'll definitely get that up for you! I really want to try one of the matte Barry M nail paints. So pretty. Let me know how you get on. Really want to try a Topshop lipstick and that red is so nice! The L'Oreal nail polish also looks really pretty! I really need some Topshop make up! Topshop packaging looks amazing~ I love the lipstick too! Hopefully you'll have more luck on finding a jacket and scarf soon! Weird that there was no tartan prints! They seem to be everywhere right now!